A woman visiting Marrakech should pay huge attention to how she dresses. Although it’s very hot in Marrakech, avoid wearing revealing clothing as it will cause unwanted attention by locals and you might hear lots of frightening words. So be sure to pack as many conservative clothes as you have. I saw many women in Marrakech wearing short-sleeved tops. While it may be okay, why not try to wear Moroccan clothes? If you’ve ever visited some of the busiest cities in the world like Bangkok or New York, you know how busy it is. But, Marrakech seems to be ten times busier city than New York. It’s always extremely noisy and crowded. There are lots of people and mopeds, bicycles, donkeys, and horses on the streets and many people drive with no rules. You won’t find any footpaths or lanes, and there are very few traffic lights. At first, it might be difficult to spend the whole day wandering around the city and a headache is unavoidable, especially if you love quiet cities. But, it’s worth it! After a few days, you will want to stay in Marrakech forever! Even if you will have different maps and handwritten directions, you might get lost once you leave your hotel room. There are an endless number of tiny streets that have no ends and they all looks similar, so it’s easy to get lost and spend the whole day looking for the place you want to visit. If you get lost and need directions, never ask strangers. You can ask a seller or policeman, they will point the right way while strangers can lead you to nowhere. When walking around the city, be ready that strangers will offer you a tour of the city. Stay away from them, or your tour may end in a place where you will be pressed to buy things you don’t need at all. Not only will you spend your money in vain, you will get lost and then spend the whole day or night looking for your hotel. Sure, not all strangers are so bad, but it’s better to ask a hotel manager about the best guides in the city. Marrakech may not be an expensive city for locals, but as a tourist you will have to pay more money for almost everything, especially taxi. If you can haggle, it’s great, but it may not help you. When traveling to Marrakech, make sure you have lots of cash (preferably the Moroccan currency.) While most hotels and restaurants accept credit cards, the sellers in the souks accept cash only. Since it may be hard to find ATM in the city, think of your cash well in advance. If you are used to dine at expensive restaurants, I recommend you to skip restaurants in Marrakech. No, they are absolutely okay and they offer fantastic meals, but street food from the market is better. This way, you will see and taste the food locals enjoy eating. Just watch what you eat and check ingredients for cleanliness and freshness. If street food isn’t for you, opt for dinners cooked in your riad. I believe the most delicious local foods cannot be found in expensive restaurants and street food is not as bad and unhealthy as most of us think. As I mentioned above, Marrakech is a super busy city. If you plan to stay more than 5 days here, be sure to find a quiet accommodation. Even if you are an energetic tourist, the hustle and bustle of the city will exhaust you in a jiff. Select your hotel and room wisely to have a sound sleep and be ready to fully explore the city of Marrakech. 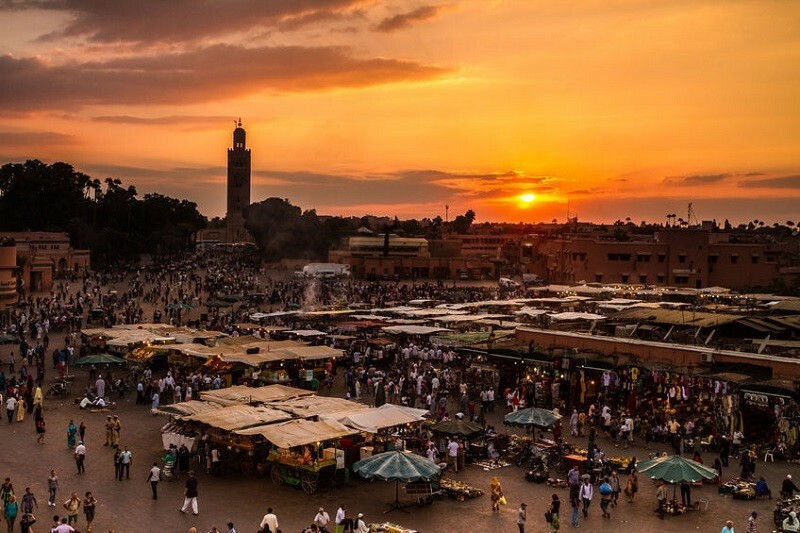 The beating heart of Morocco, Marrakech is a spectacular city everyone should visit at least once in a lifetime. Even though Marrakech is an incredibly tourist-friendly destination, there are a few mistakes many tourists make when visiting the city. Follow the above-mentioned tips, and hopefully you will have the best trip ever. If you’ve ever been to Marrakech, share your own tips with us, please.